A presentation, exhibition, and catalogue of political posters from the archives of the Center for the Study of Political Graphics. The works, created over the past 50 years, examine issues such as feminism, choice, gender equality, war, immigration, and violence against women. 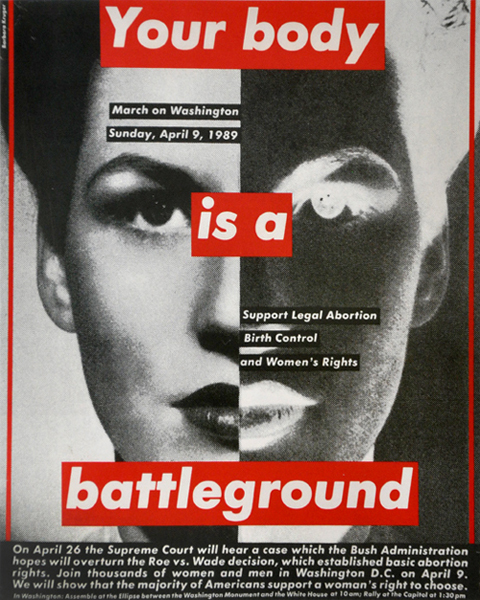 Artists include Barbara Kruger, Sister Corita Kent, the Guerilla Girls, and others from the US, Mexico, Europe and Australia. Language is a sustainable, cultural artifact, and typographic voice has long held historical importance. The words we use are significant to defining ourselves, impacting how issues are conveyed. Typography empowers communication whether as hand-painted signs, silk-screened messages, or letterpress printed words. FEMINAE presents a visual history of critical social issues. Kondrup’s activities span both fields of art and design. As a design consultant she has helped evolve extensive branding, identity, and packaging systems. As a full-time professor at ArtCenter College of Design (Pasadena, CA), she has been a dedicated design educator for over two decades. As Director of Archetype Press, ArtCenter’s unique and vibrant letterpress studio, she redefines the value of typography and analog technology in the digital landscape. Her fine art print and books are in private and public collections including AIGA, The Getty, and the Sackner Archive of Concrete and Visual Poetry. Gloria Kondrup received her bachelor’s degree in fine art and her master’s degree in design. She is currently the Executive Director of the Hoffmitz Milken Center for Typography.